If you have an Office 365 ProPlus or E3 subscription, you have 1 TB of storage per user included. 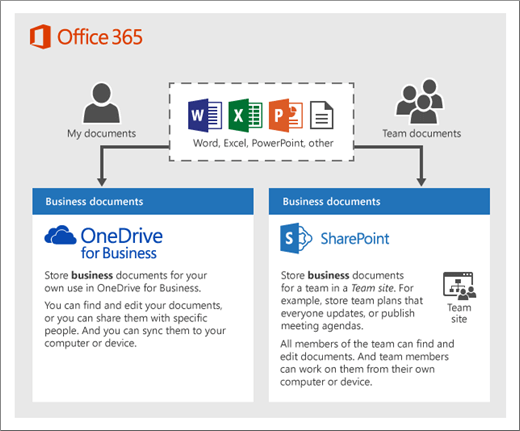 One of the best ways to set up file storage and sharing for your business is to use OneDrive for Business and an Office 365 team site together. This is ideal if you have a small business with a few employees. Office 365 includes a basic team site for you to get started. You can immediately start storing files in OneDrive for Business and collaborating on files in your team site. OneDrive for Business is designed for individual use, with the occasional sharing of files. OneDrive for Business is ideal for storing files you own. An Office 365 team site is designed for sharing and collaborating on files regularly. A team site is ideal for storing files that have shared ownership where several people or the whole team owns the files and might collaborate on them. Both OneDrive for Business and team sites provide anywhere access for you and your employees. Storing content on OneDrive for Business is like storing files on your computer; no one else can easily access them. It's ideal for storing business files that you're working on by yourself. Business files that other team members won't need to collaborate on or access regularly. An Office 365 team site is like a website, but by default it's not public; it's accessible only to people you give permissions to. It's ideal for sharing and collaborating on files. Shared documents that all of your employees can access and collaborate on. For example, collaborate on a PowerPoint presentation, store team plans that everyone updates, or publish meeting agendas. An Office 365 team subsite is like a separate section on your team site with a unique look or unique permissions for access. It's ideal for sharing and collaborating on files with a customer or partner external to your business. It's also ideal for storing files you want to keep private from the rest of the people in your business who have access to the team site. You can set up a subsite so only you (and if needed, one or two others) can access it. Learn how to create a team subsite. Files you want to share with people external to your business. Files your want to keep private from others in your business. For example, you might want to store personnel and financial information here. File storage and sharing, but the site collection is completely separate from your existing team site. A new Office 365 site collection has its own address and permissions. It can be used for internal or external collaboration. Larger businesses use site collections in the same way small businesses use subsites. A small business with advanced security needs and strong technical skills might also want to create a site collection.